Learn how to use contact information to create personalized content for your emails. You've gathered and imported a list of contacts and have most likely also collected valuable information about those contacts in the form of segmentation fields. Segmentation fields contain information about the contact such as first name, last name, state, etc. You can use this information to your advantage by creating personalized content. Personalized content, such as a greeting at the beginning of an email, addressed specifically to you, can catch the reader's attention. 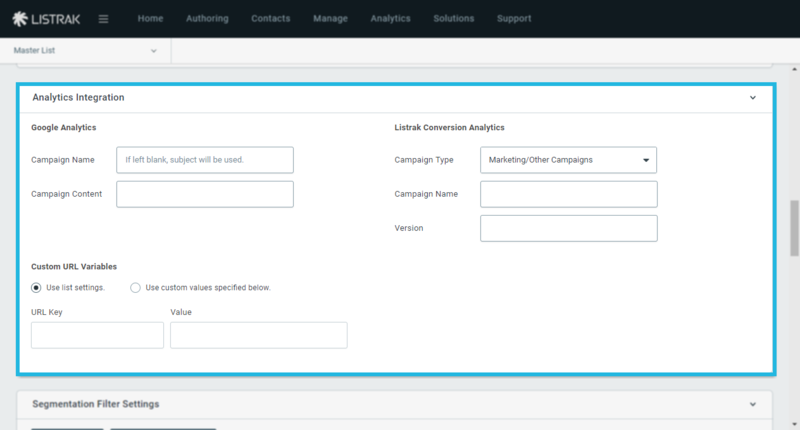 You can customize content using segmentation fields using the personalization control panel. Using a simple first name in the subject line can drive higher open rates. When done correctly, a first name in a subject line or email can work perfectly for loyalty emails, thank you emails, or special VIP email invites. 3. After you've filled out the message settings as needed, scroll down to the personalization control panel. 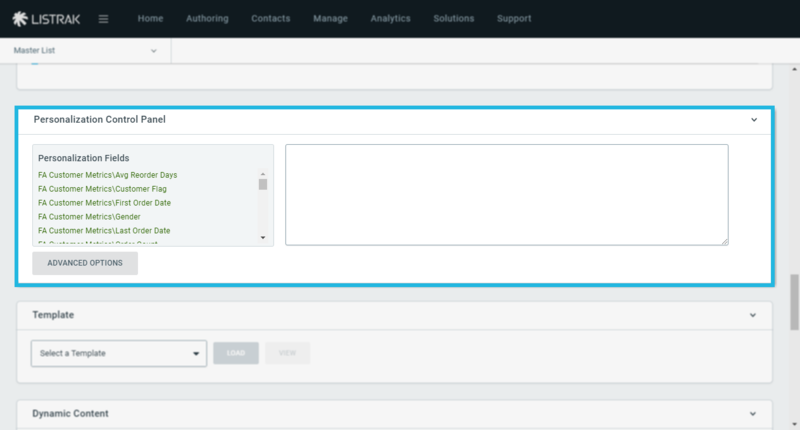 The personalization control panel contains the individual segment fields that you've created under Contacts > Segmentation > Modify Existing Field Groups. For example, you can send a message using the contact's first name if the first name field is set up and listed in the customer's profile. 4. To use the fields, first click on the field from the list on the left. The code snippet to use in the message then appears on the right. NOTE: We recommend choosing default data in case there is no information in the field for certain contacts. 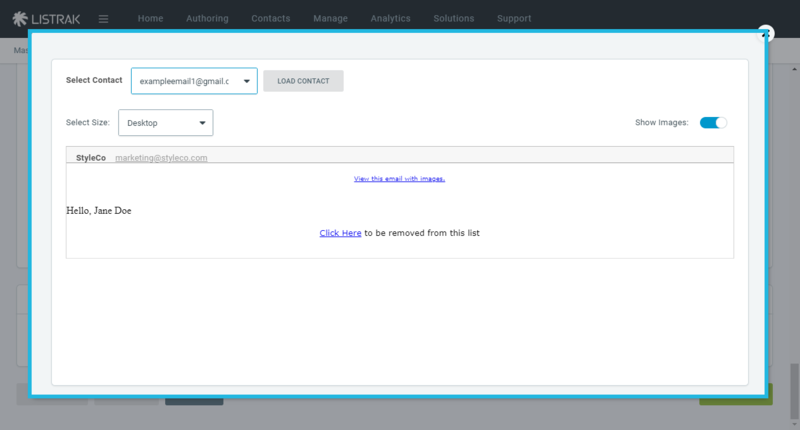 If you do not list a default option, the field will appear blank in the email. Follow the below steps to do so. 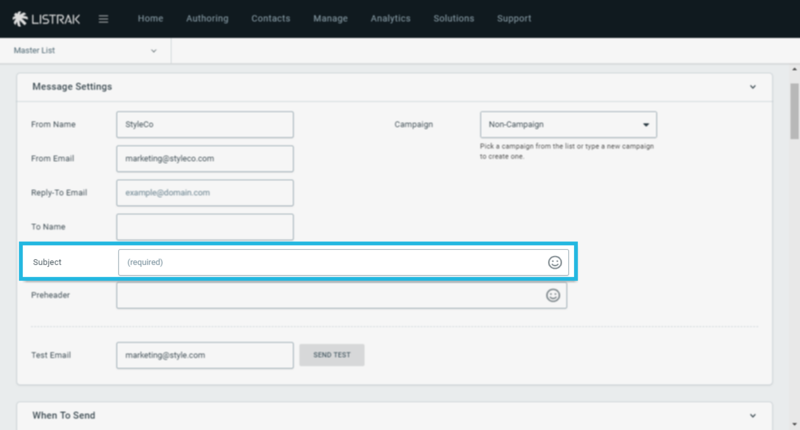 Before you begin adding personalization fields, first click Advanced Options. Now, click on the field from the list on the left. The code snippet appears on the right, but this time it includes the option to enter default text. Type your default value after Default= but between the single quotation marks. 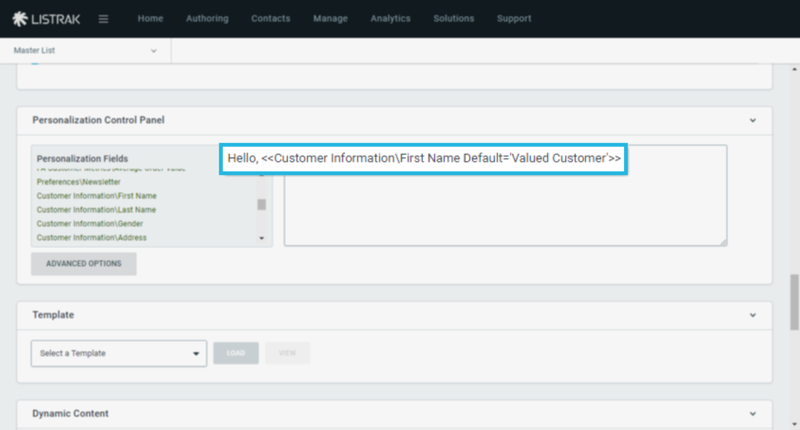 In the below example, we chose to display either the contact's first name or "Valued Customer" if the contact has no first name listed. 5. See how the message will look by clicking Preview and selecting a contact to view. 6. Click Load Contact and you'll see their specific information displayed. NOTE: If the subject line has these special characters and you are using Google Analytics, make sure to name the campaign so it doesn’t default to the subject line as this will disrupt tracking. Segmentation data can be used in Google and URL variable tracking. NOTE: Use the default data option for these to ensure that something always populates. 2. Click the Default checkbox. 3. Click the desired field in the left-hand column and the code for that field will appear in the right-hand column. 4. Enter your desired default term in between the single quotation marks (' ').